Have you been interested in finding new and exciting ways to bring food, fiber, flowers, and fuel into your learning environment? JOIN US for the 2018 California AG in the Classroom Conference. 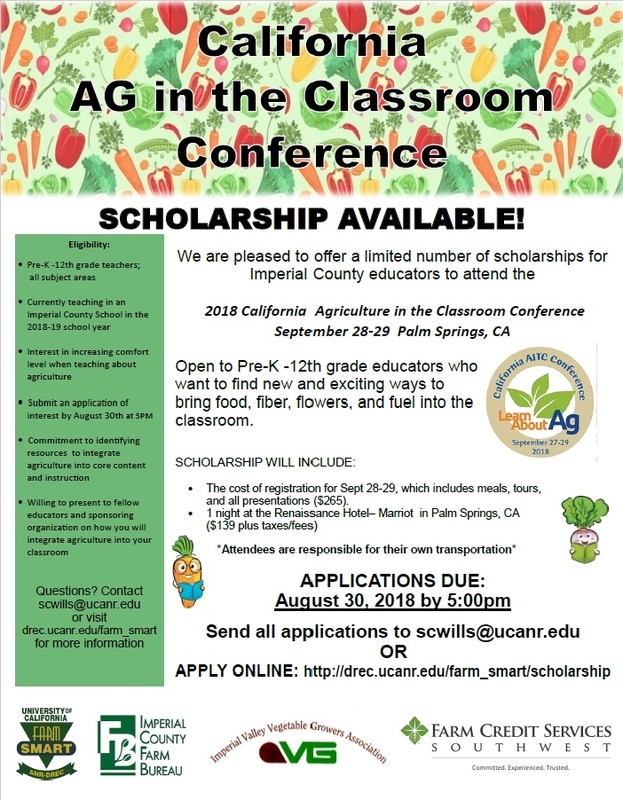 Through the generous donations of the Imperial County Farm Bureau, Imperial County Vegetable Growers Association, and Farm Credit Services Southwest there are a limited number of scholarships available to Imperial County Educators! Conference scholarship is open to Pre-K -12th grade educators in Imperial County who want to find new and exciting ways to bring food, fiber, flowers, and fuel into the classroom. The cost of registration for Sept 28-29, which includes meals, tours, and all presentations ($265).